Day 2 - Rome with the Locals. Day 3 - VIP Vatican, St. Peters Basilica and onto Sorrento. Accommodation: Grand Hotel Vesuvio, Sorrento. Day 4 - Exploring Capri, the Isle of Dreams. Day 5 - Pompeii, Matera and Alberobello. Accommodation: Grand Hotel La Chiusa di Chietri, Alberobello. Day 6 - The Trulli of Alberobello. Day 7 - Alberobello at Leisure. Day 8 - Journey South to Maratea. Accommodation: Grand Hotel Pianeta Maratea Resort, Maratea. 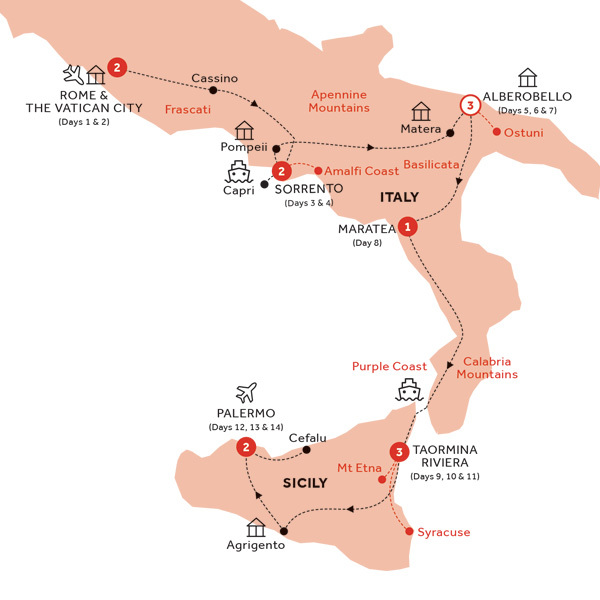 Day 9 - To Sicily and the Taormina Riviera. Accommodation: Hilton Giardini Naxos, Taormina Riviera. Day 10 - Free time on the Taormina Riviera. Day 11 - The dawn coast of Europe. Day 12 - Agrigento, the Valley of the Temples and on to Palermo. Accommodation: Best Western Ai Cavalieri Hotel, Palermo. Day 13 - Palermo and the Golden Age of the Normans. Day 14 - Depart Palermo. Dining Summary: 13 Breakfasts (B) and 7 Dinners with Wine (DW) all with tea or coffee. Vatican City: Gain VIP access to the Vatican Museums and be among the select few to admire the famous Bramante Staircase. Admire the Popes’ treasure-trove and witness the genius of Michelangelo in the Sistine Chapel before venturing inside St. Peter's Basilica to see Michelangelo's Pietà, and the splendid dome. Maratea: Wander through the rugged streets with your Travel Director to see why this peaceful little coastal town has been named the pearl of the Tyrrhenian sea. Scenic Drives: Admire the beauty of southern Italy as you travel along the Bay of Naples, past the Apennines and Calabria mountains, along Sorrento cliff top road and Capri cornich.